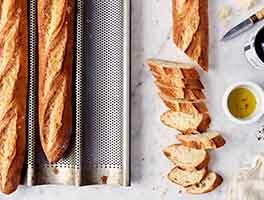 Warm, aromatic yeast bread, hot from the oven — with no kneading, AND in under 2 hours? Here it is. Add Pizza Dough Flavor for over-the-top flavor, and/or cheese powder to turn it into cheese bread. 1 hrs 32 mins. to 1 hrs 40 mins. Use non-stick vegetable oil spray to lightly grease a 9" x 13" pan. Drizzle about 2 tablespoons olive oil atop the spray; the spray keeps the bread from sticking, while the olive oil gives the bottom crust great flavor and a bit of crunch. Scoop the sticky batter into the prepared pan, cover the pan, and let it rise at room temperature for 60 minutes — it should be quite puffy, but not fragile-looking. 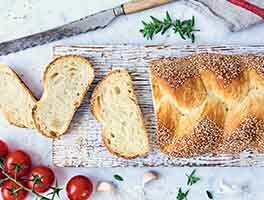 To make cheese-stuffed bread, add 1 cup of your favorite cheese, diced or crumbled, to the dough once it's been kneaded for 60 seconds. Crumbled feta, diced cheddar or provolone, and coarsely grated Parmesan are all good choices. Want to make this bread with whole wheat flour? Substitute 1 1/2 cups (6 ounces) whole wheat flour for 1 1/2 cups of the all-purpose flour. 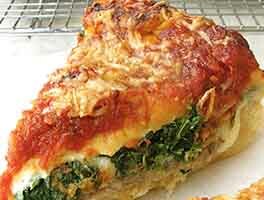 This recipe is perfect as is and also with grated asiago mixed in at the last minute. We use it for breadsticks, as well as the base for fresh roasted veggies or cured meats. My family asks for it so often I was wondering how I could make large batches and freeze them. 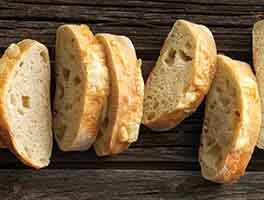 Is it better to freeze the baked focaccia, freeze the individual dough ball, or maybe even pan the dough and freeze? Any suggestions? I'm giving this a 5, although it's more like a 4.5. 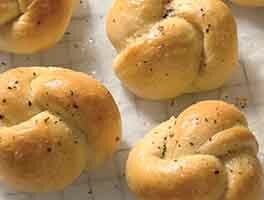 It's the easiest bread to make and turns out quite delicious every time. 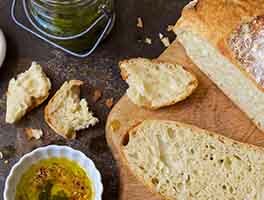 Is it the best focaccia you will ever eat? Not quite, it lacks the chewiness a long rise would give it. But its very good. I like to top it with very thinly sliced lemon cut in quarters and sea salt, or sun dried tomato and rosemary, or fresh thyme and olives...its extremely adaptable. I have made this recipe 5 times now, making minor adjustments to the cheeses and herbs each time, and each time it gets better. My neighbors bring me ingredients to use to guarantee they will get a portion. It is quick and easy and DELICIOUS! Thanks KA. We enjoyed this bread. Easy to make. I wish I was generous with my sliced red onion on top. Added Italian seasoning to the top. Best eaten the same day! What a great recipe! I needed something delicious for a lunchtime potluck and found this recipe that morning. I added a generous spoonful of an Italian herb blend to the dough while mixing and sprinkled grated Parmesan, chopped kalamata olives and sundried tomatoes over the raised dough just before baking. Delicious. Wow, such a quick easy recipe! Totally love the no kneed, straight to pan method. Lovely crunch on the outside, lush sponge on the inside. You guys have the best recipes and website! This was absolutely delicious and as easy as it gets! Can I use the big cake pan-double the 9x13, and double the recipe for a crowd? Do I need to make adjustments? Thanks for your help! I've made this recipe multiple times and it's really delicious! Would I be able to make it with the gluten free measure for measure flour ? First, thank you for providing this glorious recipe! I'm excited to share my victory with my dinner guests tonight. I did have a mishap the first time, but I should have known better. I'm working through a big bag of non-KA flour, and its gluten content is significantly lower than that of KA's AP flour. The first time I made it, the dough was too gloopy to dimple after its rise, but the crumb was extremely pleasant and cakelike after baking for the prescribed amount of time. I made it again today and added 4 tsps of vital wheat gluten to the same brand of AP flour, and the dough texture was vastly improved to the loaf I made yesterday. I was able to dimple it with no problems, but the dough still felt nice and springy and bubbly. Both times, I took the advice of the editor and added 2 tbsps of sugar to aid browning, and I was very pleased. So, if you're looking for a same-day bread with great, pleasant texture, definitely try this one out. If you're not using KA flour, your absorption will be off, and you should consider adding some vital wheat gluten to improve structure.